California Consulting is happy to provide the August Educational Grant Opportunities. Please click here to view. 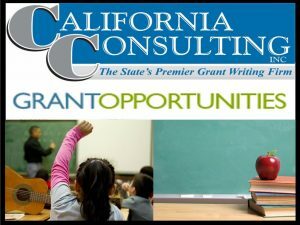 - California Consulting, INC.
California Consulting is happy to provide the August Educational Grant Opportunities. Please click here to view. California Consulting Associate Francine Castanon provided the Ventura County California Special Districts Association Chapter with an informative presentation on grant writing and funding opportunities for special districts. California Consulting Associate Derek Rojas attended the League of California Cities Inland Empire General Membership meeting on August 9th. Derek is pictured with Chino Mayor Pro Tem Tom Haughey and Chino Council Member Gary George. California Consulting is proud to provide grant writing services for many public entities throughout the Inland Empire.